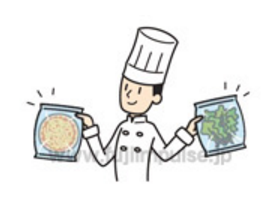 Maintain the freshness and deliciousness of food. V-301G series sealers are tabletop sealers that have excellent sealing ability, offering easy-to-use vacuum and gas-filling features. 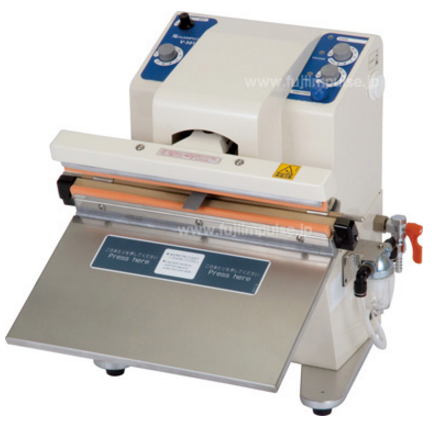 With its compact design, V-301G sealer is easily set up in narrow and challenging working conditions, and with vacuum and gas-filling features, it helps maintain the freshness and deliciousness of food. V-301G / V-301G-10DK are lightweight and compact models so that you can place and use them over the counter of your shop or workplace. 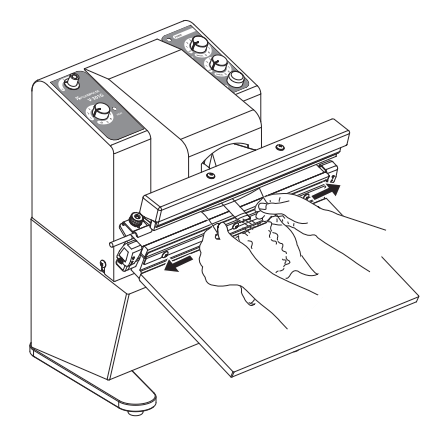 Using the sealer in a limited space of the table, you can put food items in the bag and show to seal, vacuum and gas-fill the bags just before your customers so that they feel more comfortable with freshness of your food products. Vacuum and Gas-Filling feature offers a lot longer shelf life with the delayed oxidation and mold generation of food items. It proves a lot better performance than a deoxidizer. 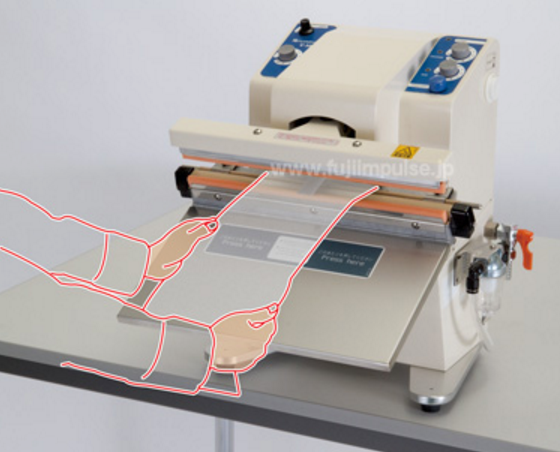 You can change the width of seal, 5mm or 10mm according to your choice. Some customers might prefer wider seal (10mm). 1. Push “START / STOP” button to get the nozzle in and out, and switchover vacuum and gas-filling process. 2. 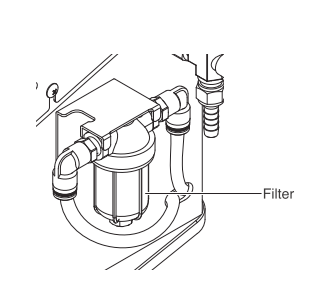 Switchover button offers you an option of [One-Time Vacuum/Gas-Filling] or [Two-Time Vacuum/Gas-Filling]. Five (5) different working options are available. You can select the option to meet your specific needs on your packaged products and required packaging finish style. 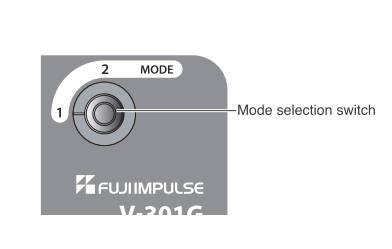 Set the time of Vacuum and Gas-Filling process according to the packaging materials using an adjustment knob of control panel. After the preset time has been passed, it automatically proceeds to the next step. 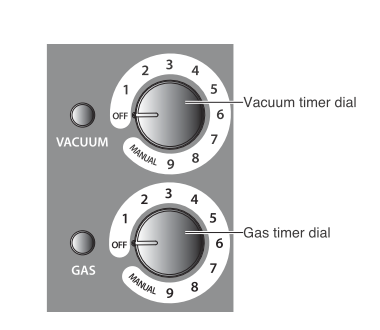 Set the knob to “MANUAL”, and visually judge the conditions of Vacuum and Gas-Filling, and proceed with your work by pushing “START / STOP” button. 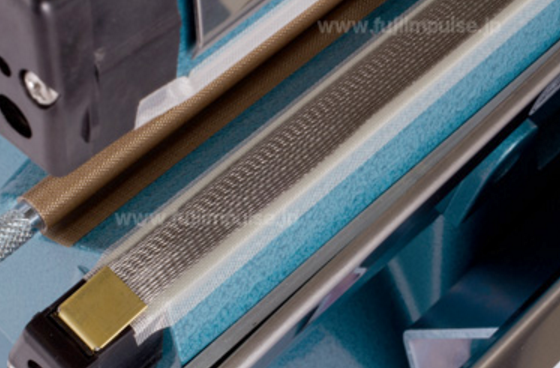 Braided heater is made of braided NiCr thin wires, and offers high flexibility to absorb uneven surface. Unlike conventional ribbon heater, braided heater makes sturdy seals with no edge breaks from its round-shaped wire edge even for gusset bags that have a large uneven surface. 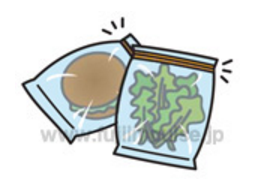 It also has a strong scratch-resistant structure and shows high durability for repeated use, and offers advantages particularly in thick films, laminate pouches and thick gusset bags. 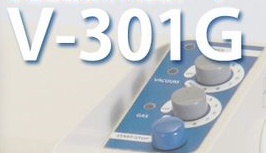 The picture shows the braided heater installed into V-301G-10DK. 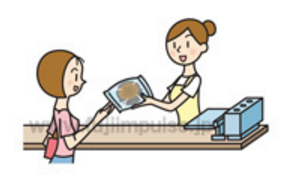 Actual effects may vary according to packaging materials, gas exchange ratio, temperature and other conditions.